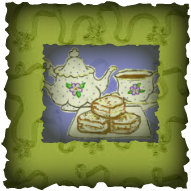 Please take some time and let me know which one of my delicious homemade tea cakes you purchased, and what you like or don't like about my product. I welcome our comments and feedback, because with your help, I can continue to learn develop ways to best serve you, and grow a thriving business. Heather is an avid home baker , wife, and mother looking to start her own cottage food business and eventually open up a tea room.